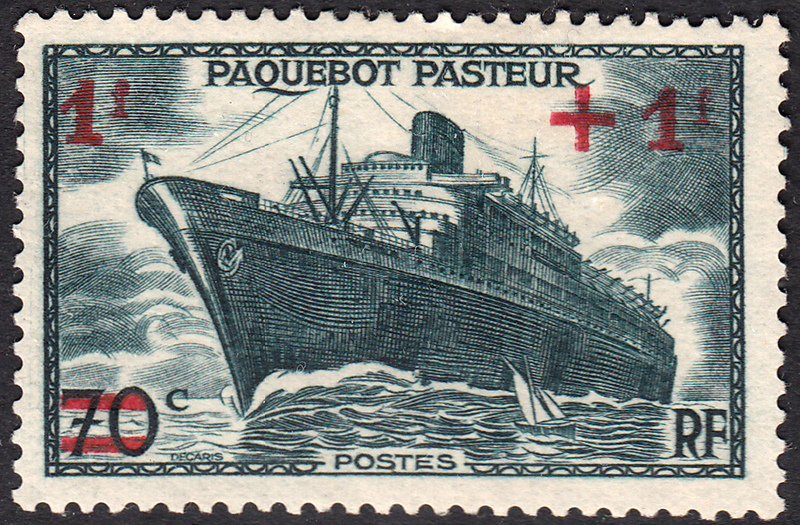 Of Albert Decaris' first four engraved stamps for France three were ships. It seems ships became one of his specialities. In 1941 Decaris engraved his third ship, the SS Pasteur, which, in my opinion, was his best ship engraving to date. The SS Pasteur had quite a colourful history. The ship's keel was laid in 1938 at Chantiers de l'Atlantique in Saint Nazaire, France, and on 15 February of that year, the incomplete vessel was christened Pasteur after the French scientist, Loius Pasteur. In March 1939 work on the ship ground to a halt when a fire broke out onboard. As a result of the fire the fitting out of the ship got delayed. 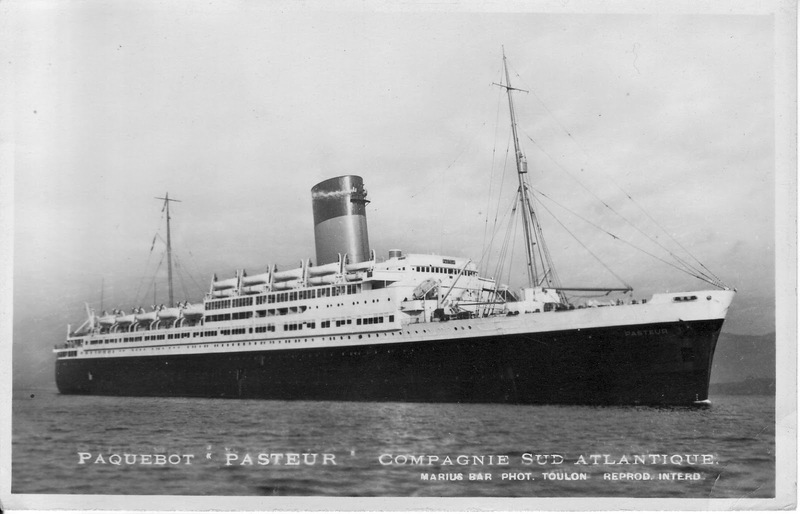 By August 1939 the Pasteur was complete. And a beautiful vessel she was. At 212.4m long and 26.8m wide, she had 11 decks and was able to carry 751 passengers. The ship was completed, as it turned out, right before the beginning of WWII. I mention this because in 1940 she was taken by the British and placed in service by Cunard-White Star as a as a troop carrier and hospital ship. During her service in this role she carried some 300,000 soldiers. Here is an image of her during service. 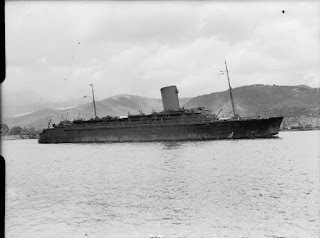 During the course of her 41 year life from 1939 until 1980 when she sank, the ship had five name changes, earning her the nickname ship-of-five-names. In 1980, en route to the ship breakers in Taiwan, the ship sank in the Indian Ocean while under tow. This, I feel, is a more fitting end for the ship. Here is some images of her last moments. Now let's take a look at Decaris' lovely interpretation of SS Pasteur. Isn't it striking! The ship assumes a truly commanding presence in the water as she ploughs toward her destination with pride.. As with his first ship design The Normandie (click HERE), Decaris here utilises a small sailing boat in the foreground to provide a sense of scale. As I mentioned earlier this stamp was issued in 1941. Its rate was changed from 70c to 1f with a 1f surcharge to benefit the Society of Sea Works. Apparently there are still some copies of this stamp without the surcharge floating around. I personally have never seen one. I hope if I ever do it'll be for sale!